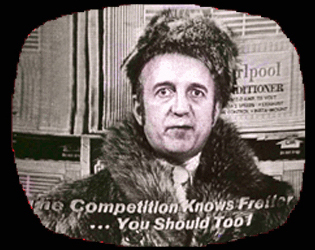 In 1944, University of Michigan graduate Ollie Fretter opened an appliance repair shop with a $600 loan from his uncle. Fifty years later, Fretter Appliance had 242 stores in six states, with net sales of $545 million dollars. The chain ultimately went bankrupt in 1996, falling victim to appliance juggernauts like ABC Warehouse and Best Buy. 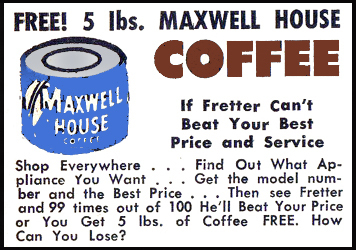 At first Ollie gave away five pound cans of Maxwell House Coffee, but in the 1970s he started pasting a specially created “Fretter House” label over the Maxwell House can. Being a good businessman, Ollie didn't give away a whole lot of free java. After a ten-year search, I've finally tracked down one of the illusive Fretter House Coffee cans. Anxious to share my find with my internet pals, I have created a miniature version of the iconic can that you can download and print on your computer. 3. Follow this link to print your Fretter House Coffee label. 4. Using a sharp pair of scissors, cut out your label. 5. Tape or glue the label onto your empty Campbell’s Chicken Noodle Soup can.